PHOTO: Allen Ramsey, DWCPhoto.com. Highlands junior Casey Dunn (9) goes up for a kill in the 36th District championship against Newport Central Catholic last fall. The Bluebirds return four starters from last year's 25-11 team. The Highlands Bluebirds volleyball team spent the three seasons under the guidance of Head Coach Katelyn Sallee near the .500 mark. But around the weekend of the September Slam at Scott High, one could sense the 2017 campaign would be much different. Following an injury-riddled 1-4 start to the season, the uptick began with a 4-1 finish for third place at the September Slam for the team's best finish in that tournament since the team started playing in it on a yearly basis in 2011. That also included the first win over rival Newport Central Catholic since 2012. The Bluebirds came together as a team and reached heights not seen in years finishing 25-11 overall for the most wins since 2008 including a 16-7 mark against 9th Region opponents. That included a Cake Classic championship and their first 36th District championship since 2012. But Highlands did not stop there. 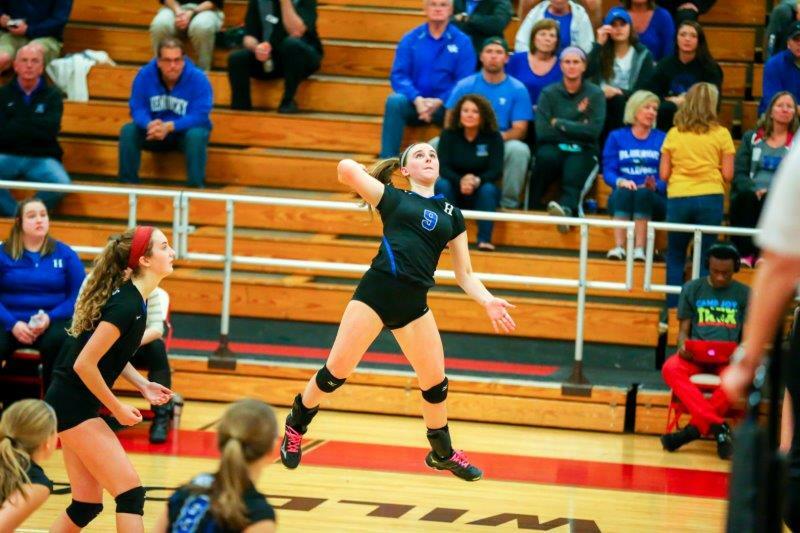 The Bluebirds fought past Dixie Heights, 3-2 (25-19, 25-23, 20-25, 23-25, 15-7) in the 9th Region quarterfinals for their first region win in the current alignment that began in 2012 and the first region tournament win since 2010. They gave a valiant effort in a 3-0 loss (25-23, 25-14, 25-15) to region power Notre Dame in the region semifinals at Covington Holmes to finish the season. "Last year was a really special season," Sallee said. "I really feel like we started to build upon several years of laying a foundation and started to see some fruit from that. I think that's continuing for sure this year." The Bluebirds entered the off-season determined to keep the momentum going. Highlands graduated five seniors from last year, but does return four starters. The biggest shoes to fill will be at defensive specialist. Last year's senior Gracie Schweitzer gave the Bluebirds a lot of quality digs there last year. The leading candidate to do that is senior Olivia Gessner. Gessner gave Highlands quality minutes in the rotation last year. Juniors Rylee Kirschenbaum and Brooke Biltz are also battling for action at that spot. But once the first pass makes its way to junior setter Audrey Graves, opponents will have to defend a variety of angles the Bluebirds attack involving a number of solid hitters led by the other three returning starters in two outside hitters in senior Margot Seidel and junior Casey Dunn along with junior middle blocker Ava Hockney. "One thing I try to do is spread the floor so that opposing blockers can't focus on one hitter," Graves said. "I've been here for a couple years. Experience definitely helps with that." A pair of freshmen could add to the number of offensive options this year. Middle blocker CC Shick gives Highlands a left-handed presence and Nicole Ossege hopes to be in the mix at right side and outside hitter. Sophomore Laura Winkler saw limited varsity action last year, but will battle for time at setter and as a right side hitter. Highlands runs a 5-1 set. "(Schick has the) ability to be aggressive and smart at such a young age," Sallee said. "We have a lot of that. We have a lot of young talent that is capable of a lot of things. We have a lot of options and I'm really excited to get in, hit the ground running and figure out what's going to work best for us. We have weaknesses obviously just like any team. Skill-wise, we're strong. We're just going to continue to build on that." Highlands graduated four hitters. Maddie McCoy gave Highlands quality time at outside and right side hitter and Mary Claire Redden helped with blocking and at right side hitter before going out for the year with an injury. 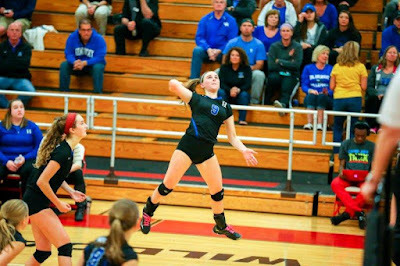 Joy Kappesser landed the match-winning kill against NewCath in the district championship as a right side hitter and Skyler Phillips backed up as a setter and outside hitter. Redden will be on the track and field squad at Western Kentucky University this spring. "A lot of us have been playing together since the sixth grade," Gessner said. "I think you can really see that on the court. A couple freshmen on the team fit in really well so I think it will be (as successful) as last year. We're all super close and hang out off the court." Two assistant coaches also returned for Highlands in Colleen Dunn and Molly Wehage-Maxwell. Jessica Ginter, a 2015 Highlands graduate, is now on staff as the freshman team coach. Highlands scrimmages Walton-Verona on July 31 and Ryle on Aug. 1 both at 7 p.m. The Bluebirds then go to the Bluegrass State Games from Aug. 3 through 5 in Lexington. Highlands opens the season Aug. 13 at Bishop Brossart. Game time is 6 p.m. in Alexandria.